The following account is taken from the, History Of The Wesleyan Methodist Church Of America In Canada – 1894-1968 , written by H. Kielty, August 1984. Pages 99-103. North Bay, in the Province of Ontario, commonly called “The Gateway to the North” is situated on Lake Nipissing, and is a division of Canada ’s three great railways – the Canadian Pacific, the Canadian National, and the Great Northern. In recent years other manufacturing concerns have located there. The royal Canadian Air Force has a large training station for personnel in the latest all-weather jet fighter planes. Lumber products have been a main industry also. With the development of mining, and the prominent part minerals are playing in the world’s economy, the city of North Bay has become a very important junction in the development of the Northland. Many are the visitors to this city during the summer months, and only a few miles distant is the home of the famous Dionne quintuplets. While the Rev. W. J. Major was pioneering a work in Powassan, Ontario, twenty miles south of North Bay, around July, 1934, he contacted a few Christian people here who were desirous of having a holiness fellowship. The Majors were not on salary, but the Conference sent them modest assistance, and friends from other churches in the Ottawa Valley, knowing they were opening up a new work, sent them money now and then. The Major family consisted of five girls, together with a boy, Edwin Wright, who lived with them for several years, eight in all. When the Majors began to open up work in North Bay, they motored from Powassan as it was cheaper to live in Powassan where they could have a garden. The first services were held in Mrs. Creighton’s home. Services at the beginning were on a Sunday evening, and also on a Tuesday night. Meetings were held in the Orange Lodge Hall. Then there was a small Pentecostal church beside the Chippewa Creek on Worthington Street East which, at this time, was not being used. Mrs. Major speaks of this little church as a “lovely little church.” It was here that the first nucleus of the congregation gathered. It was in this building where the Rev. W. E. Hamilton held a successful revival meeting. In 1936, while the Rev. R. L. LeRoy was in evangelism, he, with a quartette of four young men, namely, Bob Clifford, Claude Vipond, Eddie Wright, and Ralph Robson, were to hold a tent meeting. Because of the poor condition of the tent, due to the lack of proper care, it was not fit to be set up. Services had to be held in several buildings with some success. Around 1938, Mr. Major secured the building known as 43 Worthington Street East . It was a former boarding house, or small two story hotel, and the main floor became the sanctuary. This move brought the people to the center ofNorth Bay. People donated chairs of a variety of patterns. The Conference bought the building. The Rev. W. J. Major, with his wife and family, sacrificially laboured to promote the work of the Lord there, with evident marks of success. To them is due much credit for the vision and foresight in opening this great and effectual door. The Rev. R. L. LeRoy was appointed to be the first resident pastor in July, 1940. The Conference gave him $1,000.00 for renovation of the building. His family resided on the second floor. Mrs. Major relates, “It was wonderful what he was able to do to renovate the building both for a sanctuary and for living quarters.” A builder, interested in what Brother LeRoy was dong, gave considerable help to him at that time. This building was dedicated by the Conference President, the Rev. S. W. Blanchard, on October 11, 1940 . Early members of the congregation were Mrs. A. Rathwell, Mrs. Ivor Kingdon, Mrs. Dobberman, the Jim Rennicks, and his son Carl, Mrs. Charles Fricker, Mrs. E. D. Finnigan. In 1940 the church was organized by the Rev. R. L. LeRoy. Mr. Charles Fricker at the beginning was opposed to his wife’s going to the church. He did what he could to avoid the pastors. However, through time, and his attendance at Winchester Camp, he became a true Christian and served the church in many capacities. All the departments of the work began to enlarge in numbers and finance under the Rev. LeRoy’s ministry, and plans were made to seek a new location for the building of a proper church edifice. In September 1944 a lot was purchased on the corner of Worthington Street West and Fraser Street where a basement church was erected. This lot was debt free, and plans were completed for this building before the Rev. R. L. LeRoy closed his ministry in May, 1945. The Rev. S. L. Summers became the next pastor and built the basement church. During his ministry the home for the pastor was purchased at 215 First Avenue West . Difficulties arose in the work, and his ministry was terminated in 1948. The work at this time suffered many reverses until the Conference despaired of salvaging it. However, the Rev. and Mrs. I. C. McIntyre came in February, 1949, and were able to keep the work going under their consistent humble spirit. A new day gradually began to dawn for our North Bay work. Because of ill health, he resigned from the pastorate in April 1952. They nobly stood by the work in every way while residing in North Bay . The Rev. H. E. Enty pastored the charge for one year – good progress continued in the work. In 1953 the Rev. R. L. LeRoy was again called to the pastorate and the work continued to show good progress. The present facilities continued to inadequately care for the needs of the congregation. For a period of time much consideration was given to the present situation of the basement church, as to the completion of it, being near the center of the city with its limited parking facilities, and with the city enlarging northward and the new housing developments. Investigation for a new location was begun, and a suitable property with a bungalow and sufficient land for a church was located on McKay Avenue West . There was a new housing development in progress there. In September, 1956, the “bill of sale” was signed, by the Rev. R. L. LeRoy, for this property on McKay Avenue West , to become the new location of the Wesleyan Methodist Church in North Bay . The Rev. 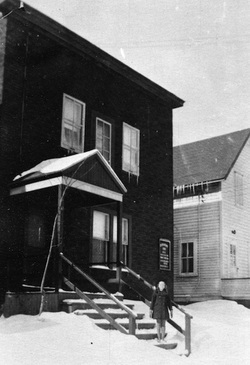 H. Kielty, then President of the Conference, signed on behalf of the Corporation for the sale of the parsonage at 215 First Street West . Through aid from the conference, the Card Call Plan of the denomination, and much encouragement from the people of the Conference, the property became debt free. Brother LeRoy added a new section to the West side of the parsonage which gave valuable space to the family. Plans were drawn up for the present church edifice on McKay Avenue West, and financing of same was completed. The new church was dedicated on November 22, 1959, at a cost of $50,000.00. The Rev. F. K. Gordon became pastor in August, 1960, and continued until August, 1967. The work continued to move ahead. Financial obligations were very demanding, but the people rallied to meet these needs. The Rev. W. A. Smith became pastor in August 1968. There is every prospect for a growing church in numbers with a strong, clear witness for full salvation. It could be said: “The lighted flame continues to burn and glow at “the Gateway to the North”. Viewing the present day congregation, many of the children of these early members are still serving the church; others have been helped through its ministry, and still others give noble support to the cause. Others have gone out into full time service for the Saviour. Miss Bertha Major, daughter of the Rev. and Mrs. W. J. Major, was the first missionary from the Canada Conference. She served five terms in Sierra Leone, Africa, in the Wesleyan Methodist Hospital as a Registered Nurse. Mr. and Mrs. Kingdon still remains a charter member of the North Bay Church. Their two sons have gone to theUnited States, where Dr. Harold Kingdon is on the faculty of Houghton College, Houghton, New York, and Dr. Douglas Kingdon is on the faculty of the State University at Chattanooga, Tennessee. Several girls of the Major family now reside in North Bay and give full support to the work.